What was Jacinta referring to? It was not just the “punk” clothing, bikinis and tank tops that are blatantly immodest. She was referring to a whole revolution in clothing and customs that was starting even at the beginning of the last century when she made this warning. The true counter-revolutionary is one who tries to see and analyze all things and relationships in accordance with the Catholic Church. This is to cultivate what is called the Catholic spirit. Hence the counter-revolutionary man becomes profoundly opposed to all things that are not in consonance with the spirit of Our Lord Jesus Christ. At the same time, he admires and promotes all things in accordance with this Catholic spirit. Seeing and analyzing in this way, he realizes that each thing – from a tablecloth or drinking glass in his home to an altar in the church – has a moral profile that expresses what it has of good or evil. When the observer perceives this, and then rejects the object on these grounds, he is basing his action not just on a whim or fancy, but on moral principles. If, as I said, an object can have a moral profile, so also, in a more general way, can a people, e.g., the Germans, Italians, etc., or even an epoch, e.g. the roaring ‘20s, the Renaissance, etc. Now, because of his social nature, man desires intensely to form a consensus with the general moral attitude of his time, even if it is erroneous, incoherent or extravagant. 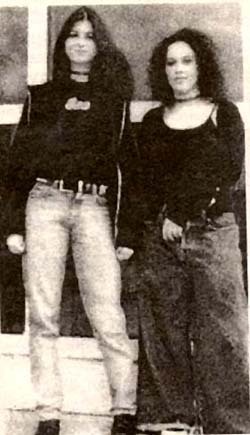 The “up-to-date” young woman or man is ready to jump from one fad to the next, like the young “jean queens” in the first picture of this article (at left). That is not the title I gave them, it was what the “teen” magazine in which they appeared called them, signaling that they were quite up to the moment in style. These girls are the proud possessors of the latest fads, which make them feel smugly superior to those who are behind the times. Public opinion favors and gives an implicit approval to certain styles and ways of being. It is natural for a person to delight in feeling at one with the consensus, to follow the trends of the moment. Most people, consciously or unconsciously, are able to discern who are the fashion-setters, who are the persons “in style” for the moment. The more they align themselves with these persons, the more they will “fit in” and be applauded by those around them. For the great majority of people, bad styles are central reason for their deviation from the path of good. I am convinced that the desire to be one with the others and to fit in with the revolutionary style of the times is the force that sweeps along the greatest number of people and causes them to wear immodest and vulgar clothing. The girls in the picture most probably did not make a conscious decision to be egalitarian or immodest. They are simply following the styles of the day, the very styles that Jacinta warned about: “Styles will come which will offend Our Lord very much.” It is a very difficult thing to have the courage to stand and act outside the public consensus and be contrary to it. But to follow Our Lord Jesus Christ, this is what we should do. 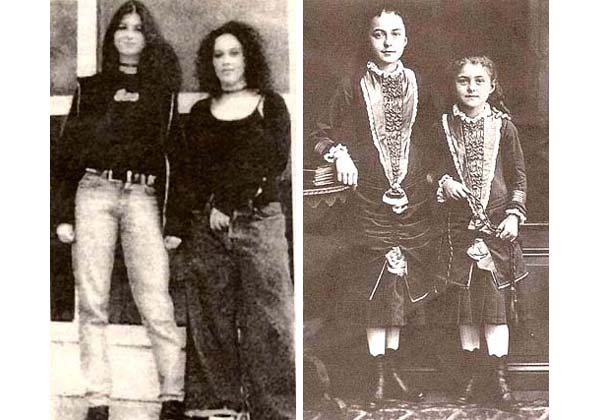 The two girls in the second picture (at right) live in the 19th century. Everything about them suggests a different attitude that governed in the ambience of their times. Their bearing, clothing and features reveal characteristics quite different from the egalitarian spirit, spontaneous freedom, and lack of restraint so lauded in our times. Their whole way of being and dressing reveals young women who tend to be ordered in their way of thinking, disciplined in spirit, and temperate in attitude and desires. One can praise these girls even if one is unaware that one of them was raised to the honor of the altar of the Catholic Church only a quarter century after she died at age 24. For, in fact, the youngest girl holding the braided cord is St. Therese of Lisieux (1873-1897), who has become one of the best-loved Saints of the Church. While Therese corresponded to the many graces that God showered on her, it is also obvious that the ambience in which she lived favored an upright and sound development of spirit. 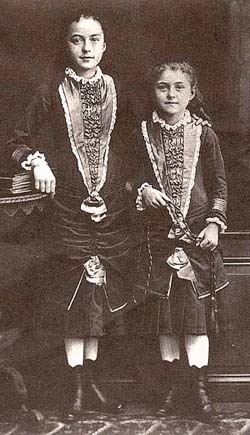 I am sure that the good ambience that her father created for his family and the dignified style of clothing that the two sisters are wearing favored the practice of virtue. In contrast, what could be said about the clothing and customs of our own times? From this we can see that there is, in fact, a moral dimension to everything. Everything follows, in one way or another, an implicit moral code that either favors order, natural law, and the love of God – or encourages disorder, perversion, and disregard for God. Everything in the temporal order – dress, attitude, manners, recreation, decoration, etc. – favors either Catholic civilization or the Cultural Revolution. The conclusion is that either we have the courage to live outside the consensus of our days, or we will unconsciously - but necessarily - become a part of it. This means that the true counter-revolutionary will manage to avoid this consensus and fight to create another that will be consonant with the Catholic spirit. Difficult? Certainly. That is why we have to have character.